Sometimes as an English teacher, I get a little jealous of the hands-on nature of the other disciplines. As I walked through the National Air and Space Museum with my children over the holidays, I drooled a little over the active learning potential of STEM, and the innovation and technology adventures that come along with it. But then I remember the power of books. The way reading can change a person's life, and keep changing it, forever. The way writing gives us true voice, and lets us share what is most vitally important to us with others. I have always told my students that when they read, they gain a chance to empathize with people whose stories they might never otherwise have understood. That by reading they grow as people, becoming more compassionate, wiser. 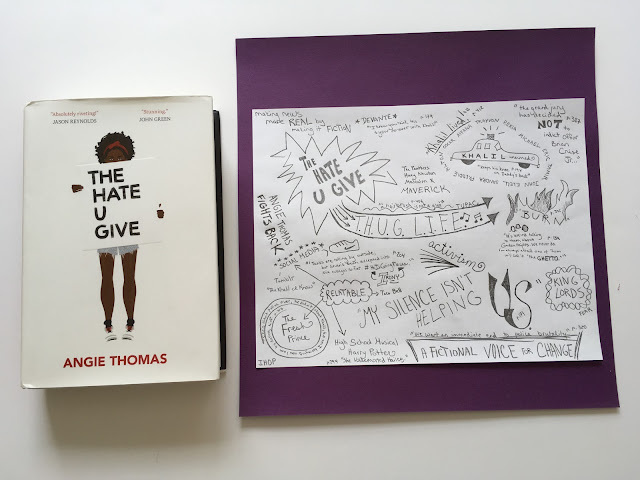 The Hate U Give, by Angie Thomas, did this for me. Though I have followed along with the Black Lives Matter movement, and certainly been upset and distressed as I heard about the various sad events, I didn't understand it that well. Not really. The story of Starr and her friend Khalil changed my understanding of America and racism. Everyone at my school, in every grade, read The Hate U Give last summer. I haven't talked to a single student who didn't like it. The narrator, Starr, who closely reflects many of the experiences of the author, Angie Thomas, is in every way relatable. As we join her at a party in the opening of the novel, it's easy to relax and follow along with her commentary on the social scene and her various friendships. Which makes what happens next all the more stunning. Download the free Sketchnotes prewriting activity here. The shocking violent event at the beginning of the novel paves the way for all that follows. While it would be easy to give up on this book at that painful moment, the rest is what makes it an amazing read. Starr cannot give up, and she does not. As we read on, we watch her come to many realizations about her friends, family, school, and society. They filter through her daily life, her interactions with her best friends and her boyfriend, her family and her community. As a reader, I was riveted. And I was changed. Download these free reading bookmarks here. 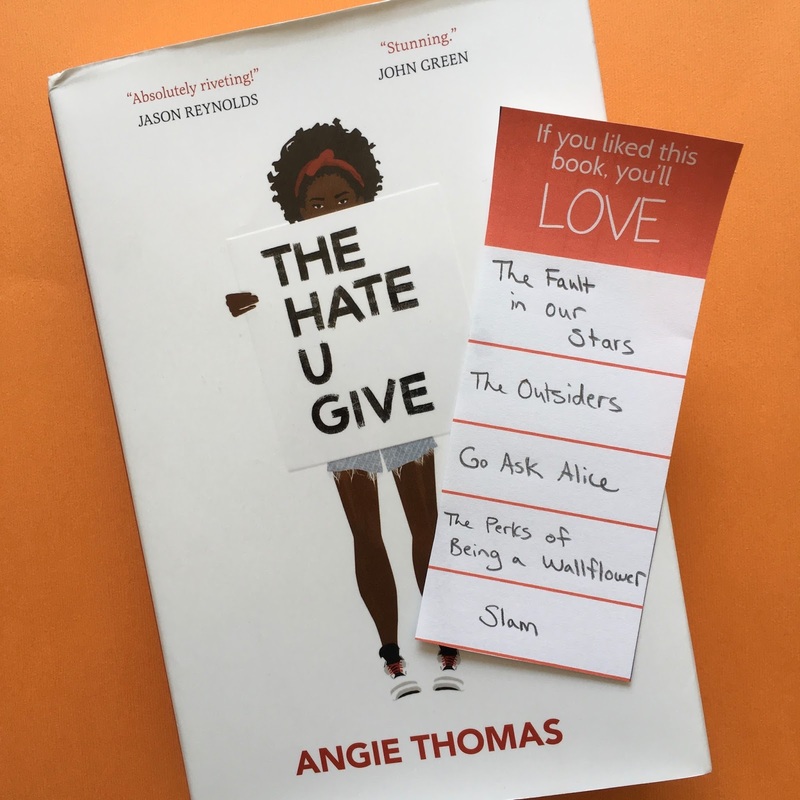 Putting The Hate U Give on your reading bookshelf, or incorporating it into your curriculum, is a powerful thing to do for your students. For those who might feel their stories are unrecognized or misunderstood, Starr's stunning tale can't help but make a difference. For those who have not faced an uphill struggle for safety and recognition, Starr's story is eye-opening. Either way, it's a win. The Hate U Give joins a short list of books in my mind that have truly powerful teenage voices, talking about things that really matter. I'd put it in the group with The Fault in Our Stars, The Outsiders, Go Ask Alice, The Perks of Being a Wallflower, and Slam, as some of the most popular student choice selections for books that take on a significant issue in teenage life. I had the pleasure of hearing Angie Thomas lecture last month on our campus. She captured students' attention immediately by saying, "I'm going to ask you to change the world. What do you have to do? SPEAK UP." She went on to share her experiences growing up in Mississippi. She talked a little bit about a civil rights leader who died in her neighborhood, and a little about seeing a picture of Emmett Till as a child. But the main focus of her reflections on her early youth was on hip hop. While she listened when her mom said "because of the color of your skin, not everyone is going to value you the way I do," what she listened to more was rap, or as she called it, "Urban America CNN." Because she felt seen and understood by hip hop artists, as if they knew that what really worried her was not racism but the drugs and gangs in her neighborhood, and sometimes where she was going to get her next meal. She did NOT see herself in the books she was reading. She did NOT relate to the main characters in The Hunger Games and Twilight, the two most popular series that came out as she grew up. Nope, she saw herself in the words of Tupac. "What Dr. King did for a generation," she said, "Tupac did for mine." She shared a poem by Tupac, "Did you hear about the rose that grew from a crack in the concrete?" Like so much that Tupac has written, it touched her deeply, as the image of the rose resonated with her own life experience. 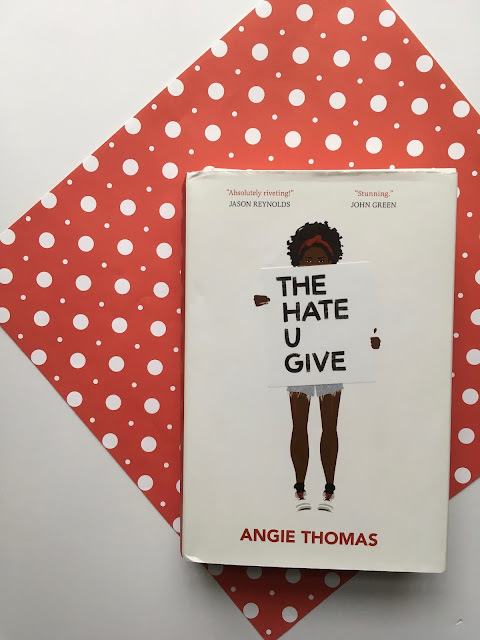 By the time Angie Thomas attended a small, mostly-white Christian college, she had gotten very good at blending in, code switching so that she could be herself as she left for school in the morning and be the perfect chameleon as she arrived at school. Until the death of Oscar Grant. As she put it, "before Trayvon, there was Oscar Grant." When this young unarmed black man died in Northern California at the hands of the police, she heard so many voices at her school blaming Oscar Grant for his own death. She channeled her frustrations, her stories, and the voice that hip hop had strengthened within her into writing The Hate U Give. The story of Starr and Khalil closely parallels the story of Angie and Oscar. Wondering about this note-taking method? 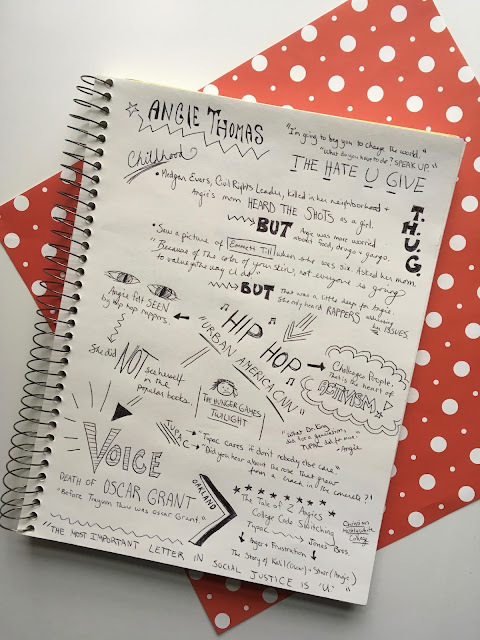 Check out The Ultimate Guide to Sketchnotes in the ELA Classroom here. Thomas wrapped up her lecture with another charge to our students. Prefacing it with a smile and the fact that she knew it was corny, she said "The most important letter in social justice is 'u.'" It was obvious that our students loved her. She spoke eloquently and frankly, showing exactly how you can be honest about things that really matter, exactly how you can channel your own creativity and voice into changing the world. So are you ready? Ready to pick up your copy and add it to your choice reading library? Or better yet, add it to your curriculum (be prepared for some mature language)? When I shared this title in my Facebook group, Creative High School English, one teacher soon reported back that one of her students who had never liked reading had quickly finished it and was asking for more like it. Hurrah! That's what we're going for. I hope it will be one of your students next. Need a fun activity for your independent reading program? 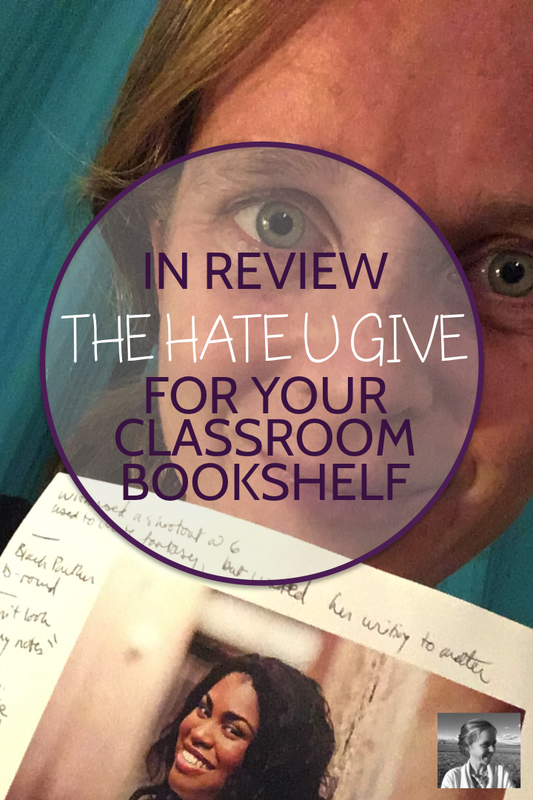 Something that will let you check in with your student readers quickly and easily, without feeling like the book police? Try out "Book Hashtags." Sign up below and I'll send it to you today.